UEFA Europa League quarter-final draw ceremony took place on the Friday. All the 8 candidates’ oppositions and schedules have been confirmed. 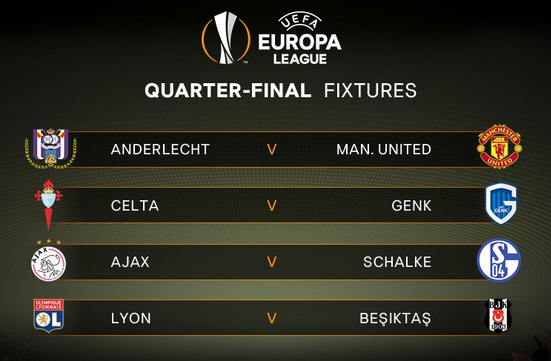 The quarter finalists of this season’s UEL are : Manchester United (England), Celta de Vigo (Spain), Schalke 04 (Germany), Lyon (France), Ajax (Nederlands), Besiktas (Turkey), Anderlecht, Genk (Belgium). The tournament’s hot favourite Manchester United, have been drawn to play Belgian side Anderlecht. They will visit Constant Vanden Stock Stadium to play the first leg and will give the homage at the Old Trafford in the second leg. They are keen to win this season’s UEL and manager Jose Mourinho’s speeches have proved that as the Special One thinks that the European glory would be their first and the most important target this season. The Purple and Whites would be slightly disappointed to get the considerably strongest side of the tournament as their counter parts. But as football is a funny game so anything is possible and the Red Devils won’t take any risk at all to bring their first ever UEL title to the Theater of Dreams. Another Belgian First Division A side Genk have got La Liga club Celta de Vigo. The Spanish club are one of the favourites and considering the Spain’s success in this competition they would be hopeful as they are the only representative of their country. Their league rival Sevilla FC won the same competition for the 3 consecutive times in the last 3 season. Sevilla didn’t feature on this year’s second top league of the Europe as they played in the UCL and just been knocked out by Leicester City in the round of 16. Dutch side Ajax will play German Bundesliga club Schalke 04. It will be another cracking contest. Ajax will host the first leg at the Amsterdam Arena before visiting the Veltins Arena to play the next leg’s game. French Ligue 1 club Lyon are going to face Turkish club Besiktas and the both team will be looking to seal their place in the semi final round. The first leg matches will be played on April 13 and the second leg clashes will take place on April 20. There are some good footballs around and stay ready for these epic battles. No team will sacrifice their opposition an inch to book the place in the next round and so will you, as you will never want to miss any single one of these actions. This year’s final will be played at the Friends Arena, Stockholm, Sweden.